Pioneers' 55@55: Festive Season "Winter Hill Double"
Festive Season "Winter Hill Double"
In keeping with our Christmas 'Tradition' (which means we have done it more than once) we had a short run up Winter Hill on Christmas Day - not early like others I know - but when the Turkey was doing gently and the sprouts weren't yet on parade. This gap in the cooking used to filled, rather pleasantly, by strolling to the pub at the end of road and, curiously, the last time we did this in 2003 we saw a family from just along the road going out for a run. Pauline must have been inspired because the following year she insisted we should go for a run. Ironically as we were setting off we saw the same family from along the road, going to the pub! 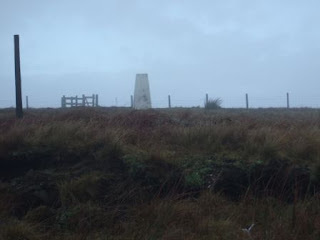 We were just a little early for the weather as the clag was just beginning to clear as we reached the summit - the blue sky is just appearing from the north east, beyond the trig point. We have just had a few days in Keswick where the weather was poor - wet, clagged in and very windy on the high fells. We had a look at the back o'Skiddaw where the posts with 'high vis' tape have been removed which is an improvement although I would concede that I was happy when they were there in 2006. Skiddaw Little Man should be easy to find in the dark although it has a more of a climb than I remembered but it is better to know that now than find out on the day. We probably got less done than we would have liked but it meant we 'ticked' a few more Outlying Fells. Home for Hogmanay for the first time for many years and in the end we decided the new year would arrive with or without us so we didn't wait up for it. One consequence of which was a bright early start to Ne'erday and a run up Winter Hill from home before most of Horwich was out of bed for a Festive Season Double - Winter Hill on both Christmas and New Year's Day. This will be a short week having been walking, rather than running, over the weekend but I should still manage a bit over 40 miles and start posting here on Fridays at the end of each training week.